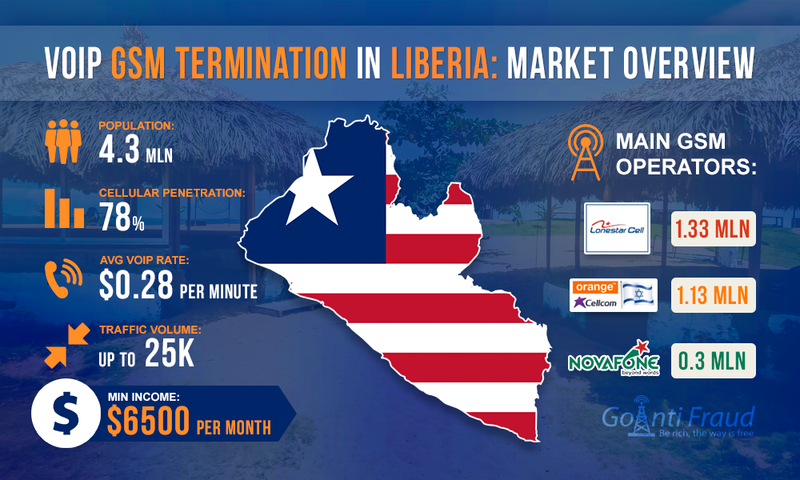 Based on the proposals on the specialized VoIP forums, the demand for call termination services in Liberia is quite high. The transit companies offer significant amounts of traffic to landin the country - an average of 12-25 thousand minutes. The average value of voip minute of conversation in this area is $0.28. Liberia is the poorest country in West Africa, and across the continent it takes 3rd place on the level of poverty. This is due largely to the civil war, which lasted from 1999 to 2003. The unemployment rate is 85%, which is one of the highest rates in the world. This led to the emigration of local residents in other African countries. Due to the fact that migrants make calls to home en masse, the amount of international traffic in Liberia increases. In Liberia, the possession of the SIM-boxes for termination is illegal. However, experts of the cellular services market note that there are no special equipment and technological systems that can identify such equipment effectively, like in other countries. At the same time, Liberian Telecommunications Authority, the regulatory body of Liberia in the telecommunications industry, as well as the International Gateway Management System are very concerned about the traffic termination in the country. Not so long ago Hussein Dakrub, an employee of the local cellular company, was arrested on charges that he terminated international calls at local rates. As a result of his actions Novafone operator lost millions. Experts estimate the annual loss of mobile communications providers in Africa at $150 million. Whatever the case, these data suggest that GSM termination is possible in Liberia. Of course, if you provide the protection against antifraud systems that mobile operators are constantly improving. As of July 2016, Liberia has a population of about 4.3 million people, with 3.6 million using GSM communication. 87 subscribers of mobile operators fall on every 100 inhabitants. According to the parameter of mobile phone penetration in the country, Liberia takes 136th place in the world. Libtelco - 0.05 million users. Standard tariffs for local calls via prepaid packages are around $0.15 per minute. But you can find better offers from the GSM operators - such as the ability to call in the country at $0.0011 per minute. Terminating 5 hours a day with an 8-port device, the owner of the gsm gateways will be able to earn 6.5 thousand dollars a month in Liberia.